After making the ladybug cake, I had to keep going. But, there is only so much cake this family can safely eat without developing eating disorders or high-tailing it off to Weight Watchers...so I had to wait. I'd love to learn how you made the wings for the bumble bee! Hi, Tobey! The wings were made using melted chocolate candy wafers. I drew out the wings on some copy paper and placed it under a sheet of wax paper. When the chocolate was melted, I filled a sandwih bag, snipped off the end and "drew" the wings following the outline of the drawing under the wax paper. The problem I had was the weiht of the chocolate. The wings had to be strong so they wouldn't break (although one DID break), but I made them to heavy. 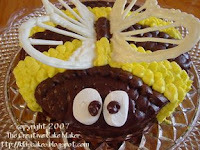 The wings on the butterfly cupcakes hold up nicely but they are small and can stand up easily. I'll have to re-think the larger cakes wings.